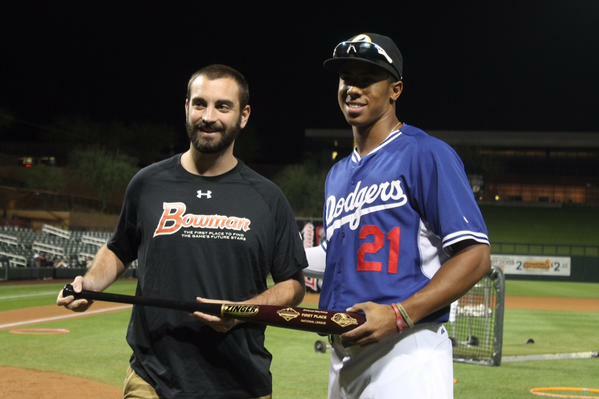 Congratulations to Dodger prospect Jacob Scavuzzo for winning the NL title and the overall championship in the AFL Bowman Hitting Challenge in Arizona. Via Spencer Fordin at MLB.com, "Dodgers' Scavuzzo wins Fall League Hitting Challenge." "It's a good experience," he said of the AFL. "You get a chance to see the game's best prospects. I'm not really that tired. A lot of guys are complaining about it being a long season, but it's not my first full season. I think I've prepared my body to play well into September or October. I feel great." Via Eric Stephen at True Blue LA, "Dodgers 2015 offseason roster breakdown." To the surprise of no one, Zack Greinke will opt out of his contract to seek a richer deal. Via Jon Heyman at CBS Sports. I am not at all surprised that several players have gotten behind their manager. Via Zach Helfand at the LA Times, "With Don Mattingly's fate uncertain, Dodgers players offer support." The oldest living Dodger, Mike Sandlock, turned 100 on Saturday. Mark Langill at Dodger Insider wrote a nice piece about him, here. Check out a great story written about Sandlock a couple of weeks ago, via Dom Amore at the Hartford Courant, here. "In '45, I had a good year," Sandlock said. "But the next season, what's his name? The shortstop, [Pee Wee] Reese came back. I had to take the No. 1 off and give it back to him, and I wore No. 4. Reese was a hell of a nice guy, but anyway, in '46 they sent me to Montreal [in the International League]. That's when Jackie Robinson was being brought in. In spring training, Rickey asked me if I would play pepper with Jackie Robinson, that's when you could play pepper [a brisk batting and fielding exercise that has long disappeared from baseball]." On another note, I wonder is this is just the first shoe to drop. Who else, if any, from the big club will be asked to go? With the season now over for the Dodgers the Chase Utley suspension appeal has been postponed, via an AP report on ESPN.